Experience comes to the forefront. There’s a lot of discussion around the issue of experience when it comes to retail. With shopping mall traffic down and Amazon moving into bricks and mortar with their acquisition of Whole Foods, retailers are wisely evaluating the face they present to shoppers. The future may lie in smaller stores with less merchandise, but with goods better presented and more unique. Criteo’s Shopper Story 2017, a six-country survey of omnishopper attitudes and preferences, reveals the factors that add to increased shopper/retailer connection. In the age of AI and chatbots, salespeople matter. 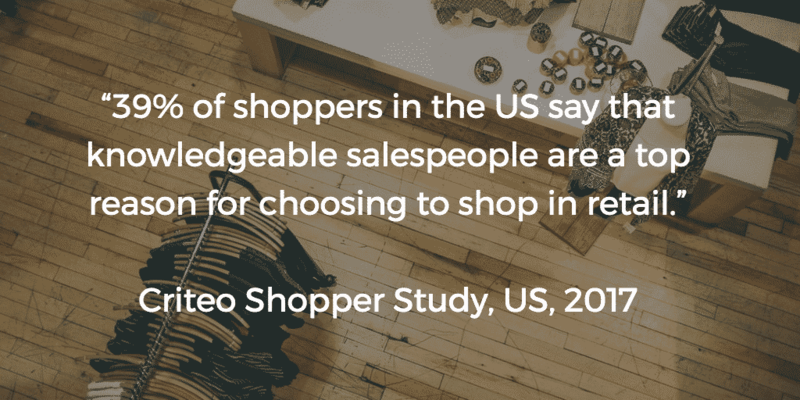 When asked about what would drive them back into stores, our shoppers noted that “knowledgeable salespeople” were one of the top three motivations. In the US, this was the most important factor behind product need and location. In Germany, it was the most important factor. No matter how far artificial intelligence takes us, people like to shop and connect in the public sphere. The study showed that 64% of omnishoppers like to shop in retail stores to find out what’s new, and 72% like to try new stores. Nordstrom, a store legendary for its no-questions-asked return policy and super helpful salespeople, has decided to focus on the customer experience in their new concept in retailing: Nordstrom Local, a store without merchandise. Instead or racks of goods, they’ll offer personal stylists who do all the choosing. They ‘ll also feature on-site mani-pedis and tailoring. Shoppers will be encouraged to click & collect or get same-day delivery of goods bought online. Merchants like Apple (with their Geniuses) and Best Buy (with their Geeks) are setting the bar for customer service with employees who are well-trained in the many details of tech purchases. In the age of artificial intelligence, personal connections matter more than ever. Customer service online means free shipping on returns. Discounts are what make the sale, right? While shoppers are often motivated by price reductions, their new “must have” is free return shipping. Here, Amazon’s Prime loyalty program has conditioned many shoppers to expect that the process should be easy — and with a quick-to-print return shipping label, not demand a time-consuming trek to the post office. In product categories like apparel, with so much personal preference and fit involved, it’s even more significant at driving the online sale. Free return shipping is obviously a significant financial investment on the part of the retailer, but offering returns in-store for merchandise bought online is the alternative that bricks and clicks retailers are offering. It’s an extraordinary opportunity to drive in store traffic and offers another chance for your salespeople to do what they do best: getting customers beyond their needs to embrace new goods they will love. Want more on the topic? Download The Shopper Story report.